Put under vehicles or leaking equipment to protect the ground from contamination. 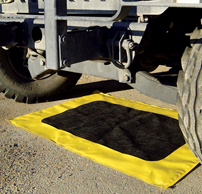 Use the Drip Sentinel Maintenance Blanket when you need something under vehicles or leaking equipment to protect the ground from contamination. Perfect for job sites that require equipment "diapers" and for field maintenance or repair. Made of 8 oz, non-woven geo-textile material that is 100 mils thick, backed by 1 layer of 20-mil fuel/chemical resistant polyethylene. Fabric backing provides an extra barrier to stop hydrocarbons from getting on the ground. Roll or Fold for easy storage between uses.